Zheng Zhou is the most feared warrior from the Shaolin Dynasty in China. His fighting and weapons skills are legendary. But when his parents are killed and sister kidnapped, he turns to a life of drugs and crime that will almost kill him. With the help of Hong Kong’s notorious Dragon Triad syndicate, Colombia’s biggest drugs cartel hatches an elaborate plan to traffic two tonnes of crack cocaine through the Port of Miami in America and ultimately into Australia and China. 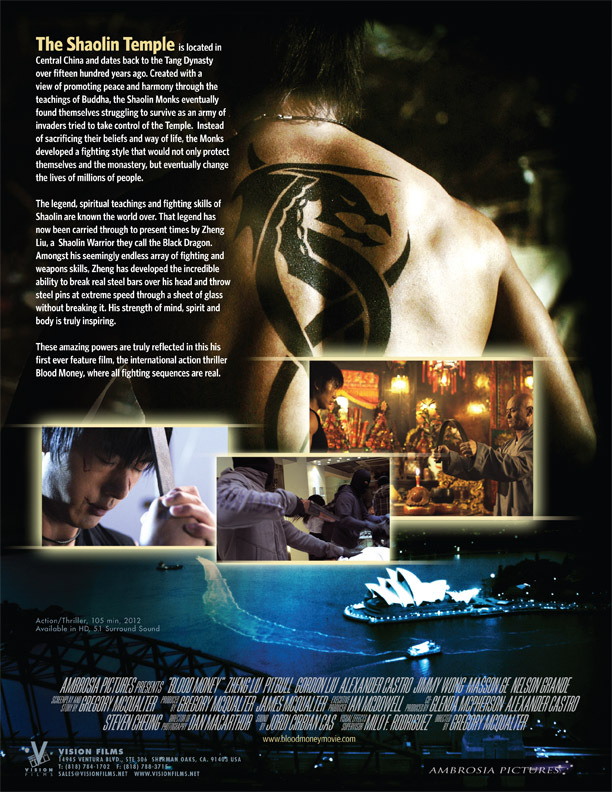 But when the partnership turns sour after the Cartel holds a Triad family member hostage, the Triads recruit Zhou to rescue the girl and kill the Colombians. What ensues is a bloodied street war across three countries. 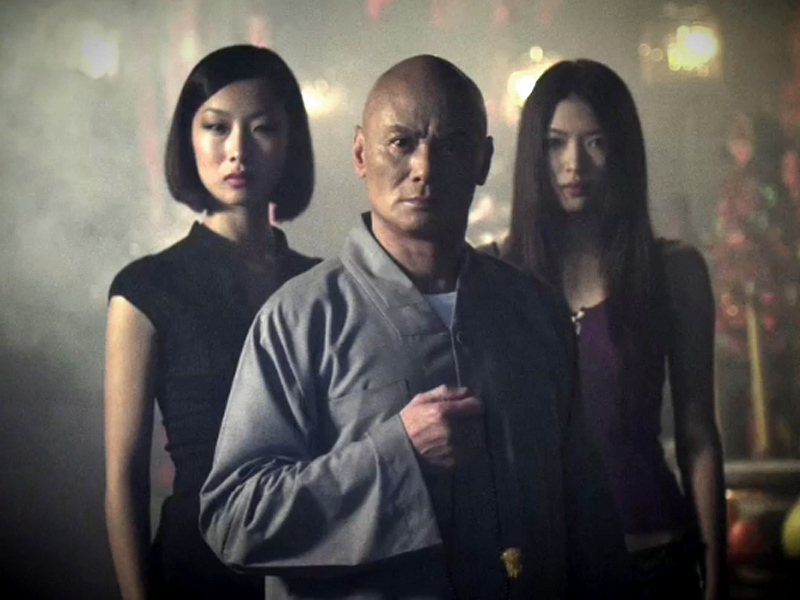 Zhou turns international Hitman with an arsenal of hi-tech surveillance devices, explosives, high powered weaponry and an array of fighting skills dating back fifteen hundred years. 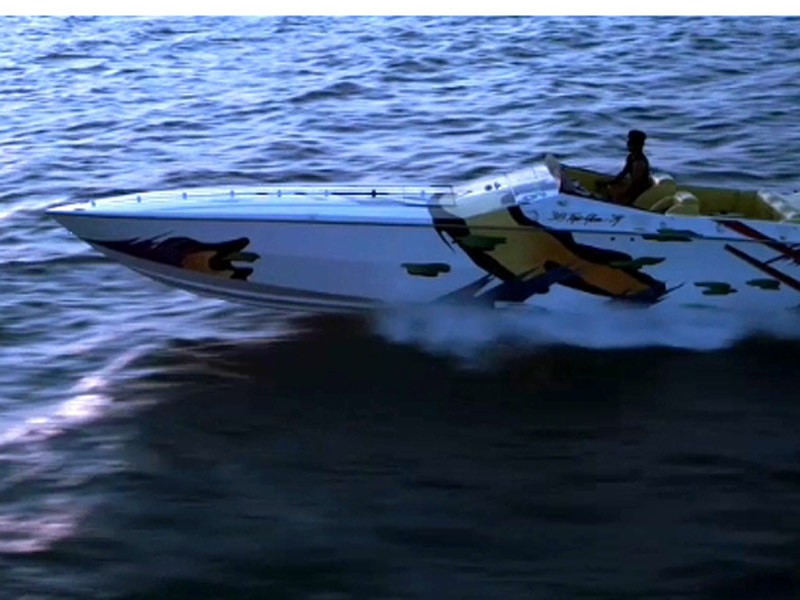 But just as Zhou rescues the hostage and takes control of the entire drugs shipment, the Triads and Colombians re-ignite their partnership with a view to having him killed. As the hunter becomes the hunted, Zhou finds he has no-where to run and no-where to hide. That is until fate steps in and a Shaolin Monk from his past not only saves his life, but changes his world forever. 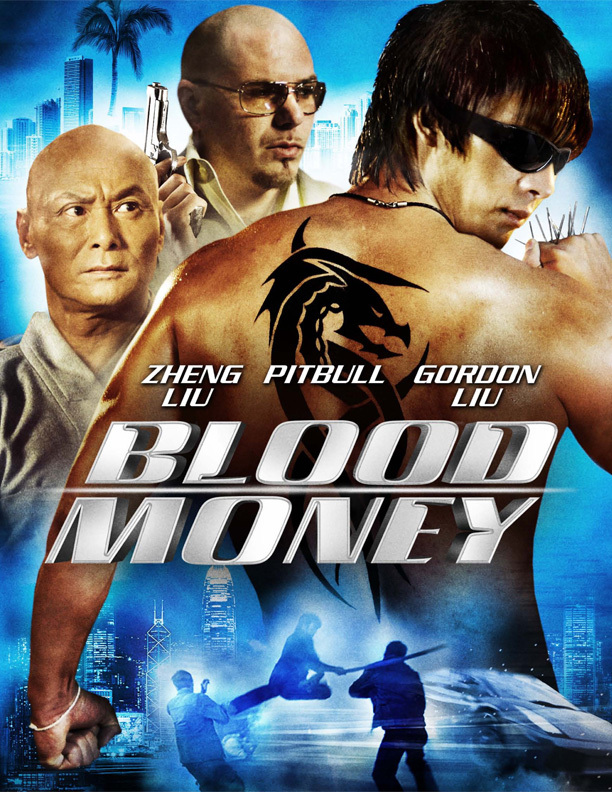 "Blood Money is an all-out action movie"
Hailing from China, former Shaolin monk Zheng Liu recently made his film debut opposite Hong Kong legend Gordon Liu and former American Gladiator Alex Castro in BLOOD MONEY. Some are hailing Zheng as the “Next Bruce Lee” due to a bit of a resemblance to the legend. In this interview, we asked Zheng about his martial arts background, making his first film, and how he feels about being called the next Bruce Lee. 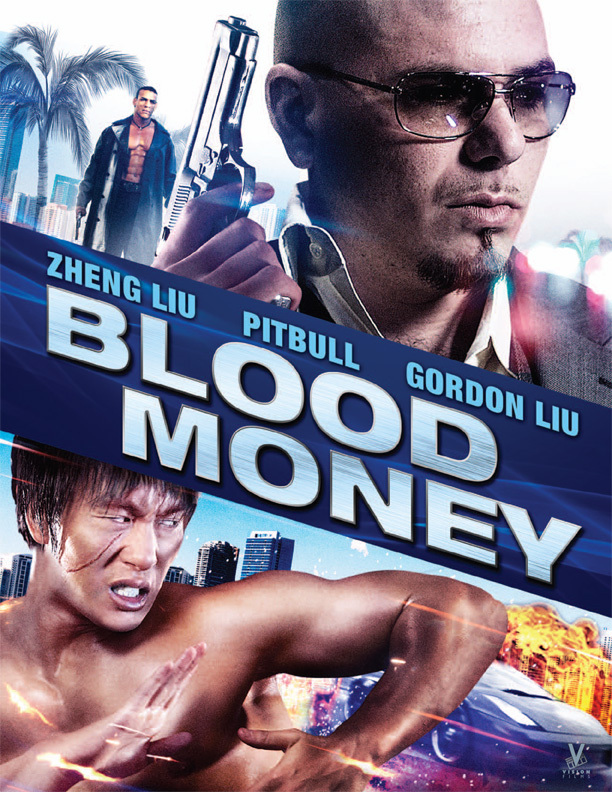 Pitbull, The Actor, Debuts in Blood Money, a Hyperviolent Shaolin Drug Flick Set in Miami. Trailer, One-sheet, Synopsis and release date posted. 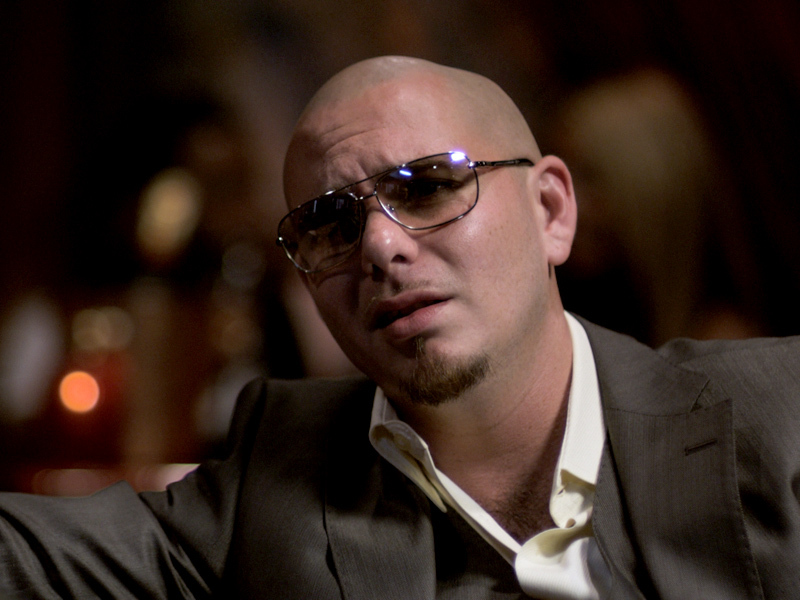 This week the Miami-based rapper/Men In Black 3 ditty composer known as Pitbull makes his acting debut in the martial arts/action film Blood Money playing himself, naturally — a rapper who just happens to drop club bangers before giving sage drug game advice like "Go hard or go home!" to stone-faced visitors after the show. Blood Money Exclusive "Pitbull" Clip: In this exclusive clip from "Blood Money" Pitbull stars as himself and gives some advice on working in the drug game. Also featuring the music of Pitbull. A young man (elopes with the girl he loves and moves to South Africa, where he works in the diamond-exporting business. Slowly, he is pulled into the underworld. Starring Manish Chaudhary, Kunal Khemu and Amrita Puri. Mixed review of Blood Money. 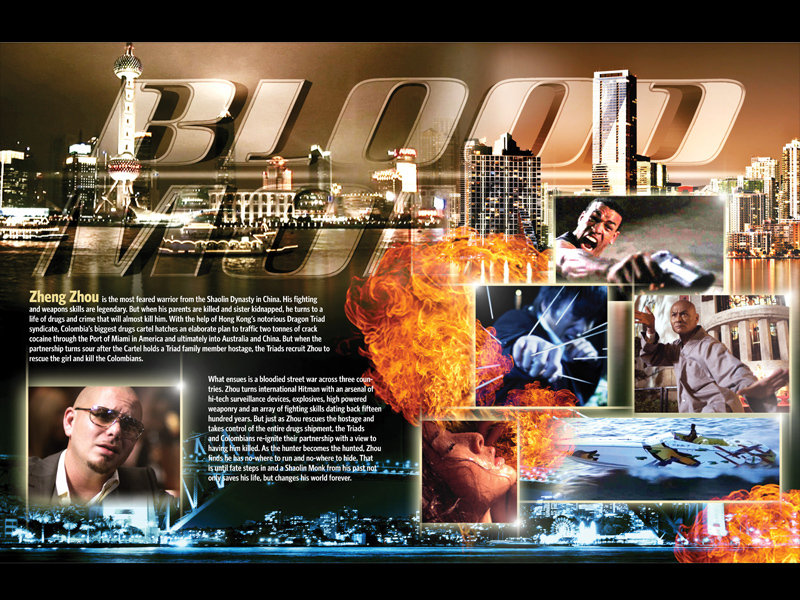 Blood Money Review: A Flaming Trainwreck Of Gun Fights And Wire-Fu.